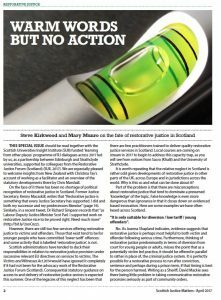 Home › restorative justice › Warm words but no action: the fate of restorative justice in Scotland? Warm words but no action: the fate of restorative justice in Scotland? Steve Kirkwood, is a lecturer in social work at the University of Edinburgh. Mary Munro is managing editor of Scottish Justice Matters and visiting senior fellow at the University of Strathclyde. On the face of it there has been no shortage of political recognition of restorative justice in Scotland. The problem is implementation. Former Justice Secretary, Kenny Macaskill, writes that “Restorative justice is something that every Justice Secretary has supported. I did and both my successor and my predecessors likewise” (MacAskill, 2017). Similarly, in a recent tweet, Dr Richard Simpson records that “as Labour Deputy Justice Minister Scot Parl. I supported work on restorative Justice nice to be proved right. Need much more” (http://bit.ly/2ooC6zz). However, there are still too few services offering restorative justice to victims and offenders. Those that exist tend to be for younger people who have committed ‘lower tariff’ offences: and some activity that is labelled ‘restorative justice’, is not. Scottish administrations have tended to duck their responsibilities in relation to restorative justice provision under successive relevant EU directives on services to victims. The Victims and Witnesses Act 2014 would have ignored it completely if it had not been for the advocacy work of the Restorative Justice Forum (Scotland). Consequential statutory guidance on access to and delivery of restorative justice sevices is expected this summer. One of the legacies of this neglect has been that there few practitioners trained to deliver quality restorative justice services in Scotland. Local courses are coming on stream in 2017 to begin to address this capacity trap, as you will see from notices from Sacro (Khalil) and the University of Strathclyde. It is worth repeating that the relative neglect in Scotland is rather odd given developments of restorative justice in other parts of the UK, across Europe and in jurisdictions across the world. Why is this so and what can be done about it? Part of the problem is that there are misconceptions about restorative justice that tend to dominate a presumed ‘knowledge’ of the topic. False knowledge is even more dangerous than ignorance in that it closes down on evidenced based innovation. Here are some examples we have often heard across Scotland. Links are to the articles in the special issue of the SJM. “It is only suitable for diversion / low tariff / young offenders”. As Joanna Shapland indicates, evidence suggests that restorative justice is perhaps most helpful to both victim and offender following serious crime. Furthermore, thinking of restorative justice predominantly in terms of diversion from court for young people or adults, misses the point that as a potentially victim led practice, it should be offered in parallel with rather in place of, the criminal justice system. It is perfectly possible for a restorative process to run after conviction, sentence and perhaps during, a prison term, if that timing is best for the person harmed. Writing as a Sheriff, David Mackie sees there being little problem in taking communicative restorative processes seriously as part of community orders. The range of possible applications is also beyond that commonly considered, as we see in Hazel Croall‘s article on corporate crime, Jenny Johnstone and Ian McDonough’s reflections on historic child abuse, Rania Hamid on thinking about responses to hate crime, Estelle Zinsstag’s note on sexual violence and the Bill Whyte and Niall Kearney‘s work on the RiSC (Restoration in Serious Crime) project. Paradoxically, as Stewart Simpson and David Orr suggest, even in youth justice, restorative practices seem to have declined in recent years as practitioners negotiate the complex but potentially creative policy landscape and try to understand how restorative justice might find a place within it. Part of the problem locally seems to be that an early evaluation by of restorative services for young people in Glasgow was reported as being equivocal in its impact on young offenders, and this was widely reported, incorrectly, as a finding that restorative justice did not work (Dutton and Whyte, 2007). It is sometimes said that the evidence on restorative justice was “a mile wide but an inch deep”. Although the quality of research and evaluations on any justice intervention varies considerably, it must be stressed that we now have an increasing body of analysis that suggests both where and how restorative justice is helpful, and also in some cases, where it is not (Strang and Sherman, 2015). Having said that, there is a risk that ‘working’ is only understood in terms of the impact for change on the part of the person responsible for the harm (the offender) perhaps as a boost in the desistance process. There is evidence that this can happen, although the interaction between behaviour change and participation in a restorative process is likely to be complex. So what works for victims? Restorative justice works for many victims. Restorative justice should be thought of as a process that will be helpful to many people harmed and should be assessed on that basis, albeit that this is trickier to capture statistically. This is why we invited Catherine Bisset to think about how logic models of evaluation might be a useful tool to understand processes and outcomes. “It is the same as mediation”. Although the language of mediation is used in some European jurisdictions, the practice of restorative justice assumes that there is no moral ‘level playing field’ between the people involved. It is axiomatic that the person responsible for the harm accepts it, and that there are no matters of contention or doubt as to the evidence for culpability that carry forward into the restorative process. “It is the same as reparation, or community payback, or victim awareness courses”. Restorative justice is about a potentially healing communication between the person responsible for harm and the person who has been harmed by that same offence, and possibly the wider community. Some form of reparation may be an agreed outcome of the restorative process but this may be less important to the person harmed than the opportunity to have their questions answered and undertakings by the offender to take steps to change their behaviour. Moreover, often the forms of ‘reparative justice’ used in Scotland, such as unpaid work within a community payback order, have little or no connection with the original offence, and the direct victims of crime are unlikely to have a say in what they should involve. This means that the likelihood that these activities will increase people’s understanding regarding the impact of their crimes, feel as if they constitute making amends, or are experienced by victims of crime as genuine forms of restitution, is extremely limited. It is interesting to reflect that the four Rs of criminal justice social work in Scotland, restrictions, rehabilitation, reparation and rehabilitation, do not include restoration. Such services may work on behalf of victims of crime, in the sense of trying support those who commit crime to make amends, to protect the public, and ultimately to prevent further victims of crime, but they rarely work with victims of crime. The consideration of restorative practices in relation to criminal justice social work has a lot of scope to enhance its transformative potential as well as likelihood that victims of crime feel that such work is really being done in their interests. At the same time, as Fergus McNeill outlines, there are connections between desistance and restorative justice in theory and practice. “It is about apology and forgiveness”. The decision to forgive is a highly personal matter. The person responsible may apologise as part of the restorative encounter but there is no reciprocal expectation that the person harmed should respond by ‘forgiving’. 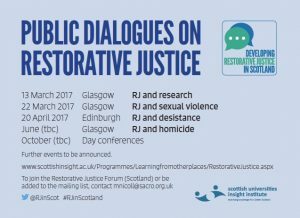 Just as our 2017 programme of dialogues and then our final deliberative conference in the autumn are open to all and any ideas as to how restorative justice might be developed in Scotland, the articles in this issue differ in their vision as to its place alongside or embedded in the system, and arrangements for funding, delivery, collaboration. We are not being presciptive here not least because it would be arrogant for a handful of (mainly) academics to presume what would work on the ground in local communities in local circumstances (see Webb) including where appropriate, our prisons. It is the informed dynamic creativity, imagination and wish to make things better on the part of many people across Scotland, that will take this thinking forward and translate evidence based restorative justice into actions best suited to this jurisdiction. This issue of the the SJM has been supported by the Scottish Universities Insight Institute (SUII) ‘learning from other places’ programme of RJ dialogues led by us over 2017. 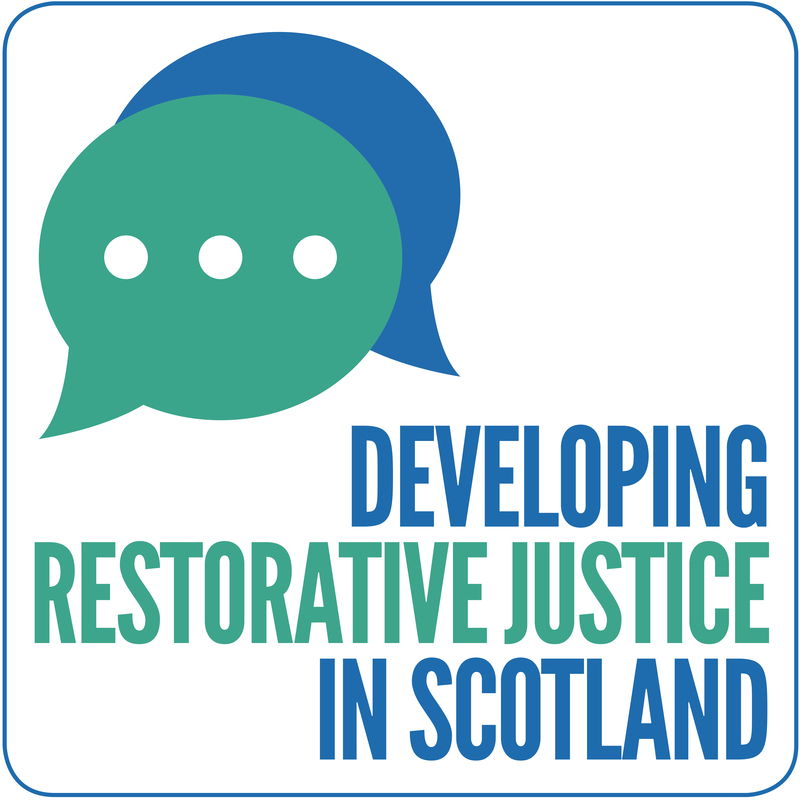 The programme is a partnership between Edinburgh and Strathclyde universities, supported by colleagues from the Restorative Justice Forum (Scotland). This post is a version of our editorial.